Mr Frog loves all treasure hunt activities and we play it at home quite often. Every summer we organize a big treasure hunt for him and his cousins - they follow the clues running through the fields of countryside. They even have to dig up the treasure on their own! It's kind of family tradition now and lots of fun for all the kids. Easter is coming soon and we have lots of plastic eggs at home. 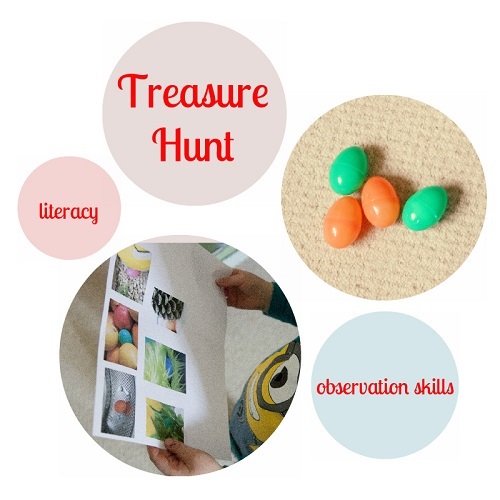 They are perfect for treasure hunt with a bit of literacy :) Don't worry if you don't have plastic eggs though - you can use small envelopes, little boxes or just folded pieces of paper with written words. In each egg I hid a word which was a part of a sentence - a clue where to look for a treasure. Then I hid the eggs around the house and in the garden and took a photo of each egg in big closeup. 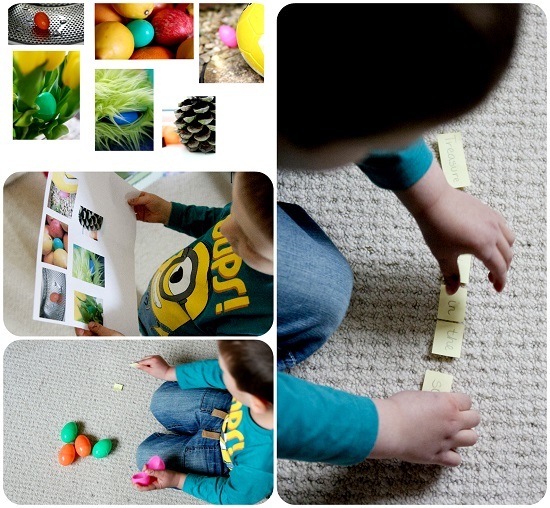 Mr Frog's task was to find all the eggs using the photo clues (great to practice observation skills and attention to detail ). Then he used all the words he found inside the eggs to arrange the sentence and read it to find out where is the treasure (literacy skills and reading). Simple isn't it? Well, arranging the sentence can be a great challenge for 5 year old! I think it could be great variety to traditional Easter egg hunt. We play like this at home all year round. We use photo clues to find hidden toys or cars - it is a great way to develop observation skills and talk about the objects' texture (the closeup photos are perfect for this).